Well, the crew at Classic Design Concepts has done it again! For all you baby boomers out there here is your chance to own a brand new 1967 Ford Mustang fastback. The cars will be sold as completed and running vehicles using bodies supplied by Dynacorn - the same company supplying the new Camaro bodies. Numerous suspension updates available - rest assured this car will handle! For more detailed information contact: Classic Design Concepts, Inc. 42860 W. Nine Mile Rd. Novi, MI 48375. www.classicdesignconcepts.com 866-624-7997. Classic Design Concepts, LLC recognizes that Baby Boomers have wants… They want to rejuvenate the past, they have worked hard and want to enjoy the rewards of working hard and have the best and they demand quality. CDC recognizes the love of cars that Baby Boomers have. So CDC has designed and engineered an all new '67 Mustang--as a matter of fact they will be building four distinct versions of the '67 Mustang. 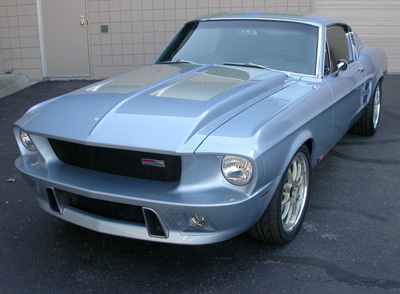 CDC will be debuting two of their four baby boomer '67 builds at the 2007 SEMA Show in Las Vegas. 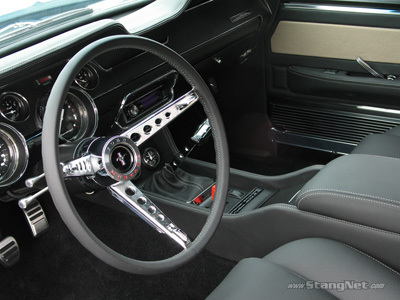 The first of the four will be a re-creation of a base 1967 Mustang using all Ford licensed products, with a few necessary amenities to make it more appealing to today’s drivers. The second will be George Huisman’s vision of a '67 Mustang, code name “Flashback”. George Huisman, owner and Baby Boomer, has taken his passion of the Mustang and superb design vision to create the '67 Flashback. This vehicle is new from the ground up. Though the styling cues may shadow the past, the Flashback is loaded with modern amenities, attention to detail and quality. As a Baby Boomer, previous Concourse Judge and enthusiast, Huisman has created a vehicle with tight fit and finish on the exterior, the interior and the drive train and engine bay, while maintaining many key cues that make it a classic… An engine that is anticipating over 600 horses! Huisman partnered with key quality-conscious aftermarket companies to create this all new “Flashback”. These vehicles are not just an exercise; these will be available as complete vehicles through CDC in 2008. The vehicles can be equipped with base components, or you can add the features you want to make it your own. Starts with a Dynacorn, Ford authorized body. This is the base to an extraordinary exterior design. The Flashbacks will be standard with the CDC redesigned, front fascia (with functional brake ducts), fog light package, bright mesh grille, rear fascia with opening for twin dual 2 7/8” exhaust tips highlighting the 2 ½” dual exhaust, functional lower side vents, molded scalloped upper sail panels, Flashback badging, taillights with integrated reverse lights, high capacity cooling system, external oil filter system, stainless steel brake, fuel and coolant lines, Ford 9” rear end, dramatically increased head and leg room, power windows, locks, and power driver seat and interior trunk release. The standard equipment does not end there! There is also custom gauge package including: speed, tachometer, temperature, fuel, oil, boost, and fuel pressure, all built under a leather dash pad. The standard electronic air condition system provides comfortable cruising in the dead of Summer or those slow moving parades. The standard center console with shifter, secondary gauges, cup holders and storage adds the perfect touch of current amenities while maintaining some key classic touches. Yet another touch of Huisman style, stitched leather sport seats and fold down rear seat. The CDC engineered and designed modular interior includes door panels, headliner, rear seat panels, rear sail panels, resulting in a 2008 standard of fit and finish. The stereo system is a JVC Bongiovi tuned head unit with a Rockford Fosgate components and amplifiers. All in all, the standard features alone make a high end package, now for the options. With the extensive list of standard equipment what is left for options? Plenty…. 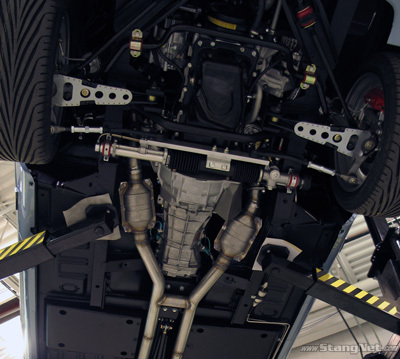 A prospective owner can choose from a laundry list of high quality suspension options from RRS. This vehicle will be equipped with the RRS Phase 4 package. This package includes front 13.6” two piece molycarbide rotors, directional vented, six piston calipers, and adjustable performance shocks with fully adjustable ride height. The rear brake kit is 12.5” Molycarbide rotor. All of this fitted to a Watts link rear suspension with extra long torque tube and fully adjustable rear height coil over shocks. The engine that these components will support is the 600 HP 5.4 liter supercharged V8 and a 6 speed Tremec transmission. This Flashback will be equipped with the CDC designed heat extracting Cowl Hood with built in turn signal indicators. This custom painted Metal flake Sherwin Williams Pearl Blue Flashback is highlighted with 18” Forgeline Wheels color matched to the stripe on vehicle. This car is the ultimate Baby Boomer's build.